Fierce competitive environment, maximizing customer experience, and delivering business intelligence to the top management are some of the key forces driving the industry today. To stay competitive, CSPs need an independent and objective review of network design, assess deployment vis-à-vis global standards. TCTS offers a unique experience in managing multi-vendor networks and experience of auditing global CSPs. With the experience of auditing networks and operations of global telcos, some of them with 18 million subscribers implementing LTE, Russian 4G operator, major service provider in South Africa, leading telecom service provider in Ireland and many more. TCTS provides a comprehensive Audit and Compliance service that touches every vertical of network and operations of a service provider. This service not only aims to identify gaps and non-adherences, but also recommends improvement plan and strategy, implementation roadmap, cost-benefit analysis, quick wins, certifications etc. TCTS engages a specialized team of technology and process experts who follow a consultative approach to meet specific business and operational needs of a customer. Moreover, we extend our support for recommendation and implementation as a partner enabling the customer to cease maximum benefits. 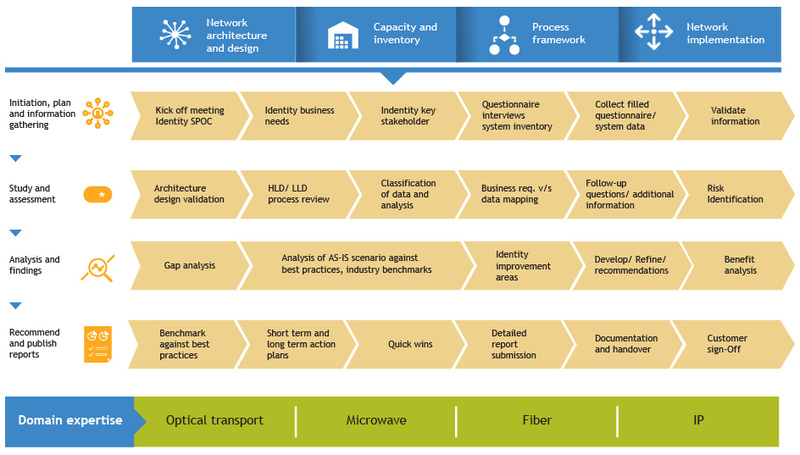 Assessment of passive network infrastructure like fibre, shelter, tower and related components.